Looking for a garden set that's modern and stylish as well as practical for everyday use? Then look no further than the Rio White 6 Seater with Palermo Ocean Bench Outdoor Dining Set. 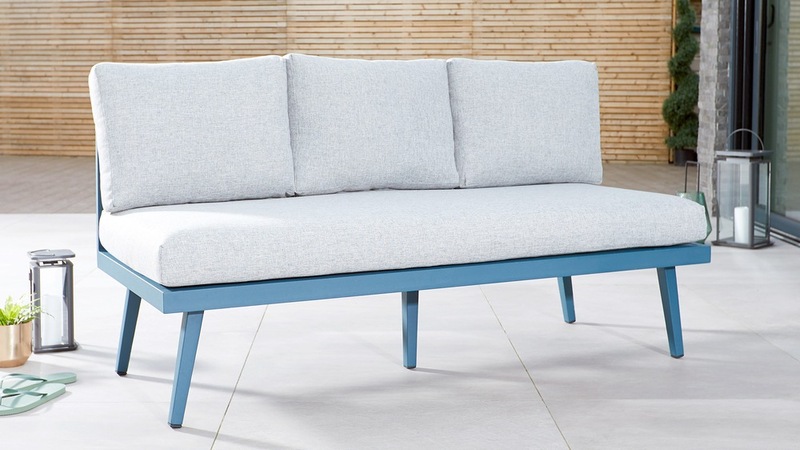 This six seater set has a contemporary vibe, from its crisp frosted glass table top with built-in ice bucket to the comfy and modern 3 seater benches. Whether you're looking to use your space for big get togethers or evening meals with the family, this set is sure to be a welcome addition to your home. 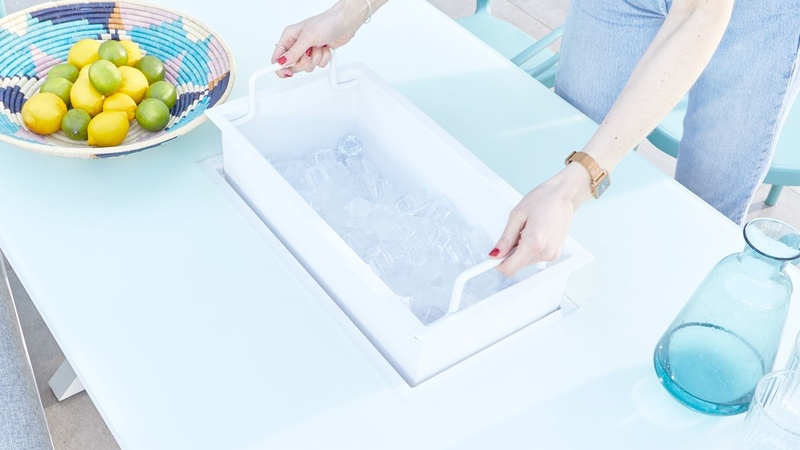 The central drinks bucket on the Rio garden table is a great feature of this table, allowing you to keep drinks cool in the summer sun. The bucket can easily be removed for cleaning and emptying using handles that neatly tuck away. When not in use, there’s a convenient cover that sits flush with the table top, so you can still use the whole table top. 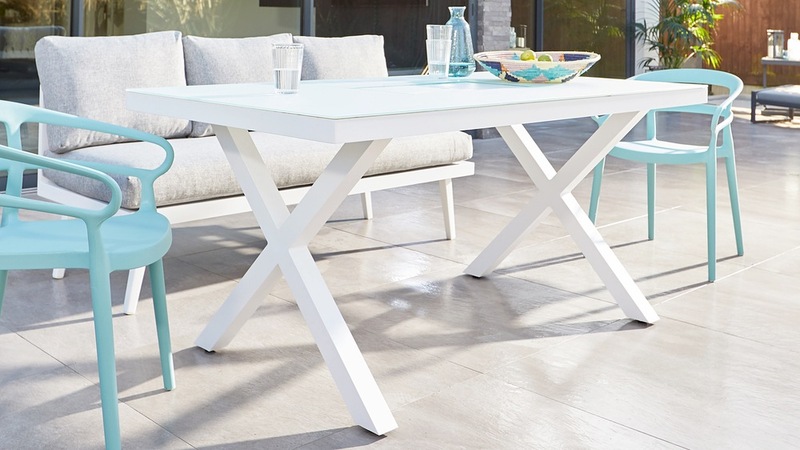 The frame of the Rio garden table is made from white powder coated aluminium, which creates an effortlessly modern and crisp looking finish. 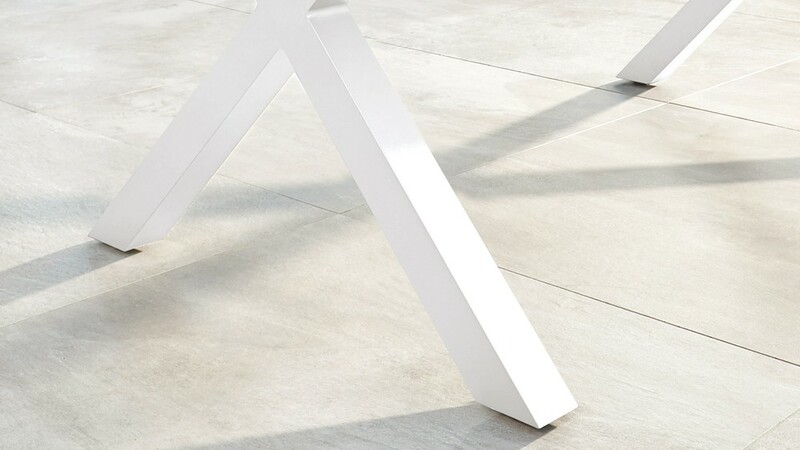 The natural qualities of aluminium mean that it doesn’t rust easily like other metals, so you don’t need to worry about your garden table during those summer showers as it’s perfect for outdoor use. Additionally, aluminium is sturdy enough to withstand windy weather, however, it is lightweight enough to easily move and reposition around the garden. This is where the tray table will become invaluable, as you can create a handy side table anywhere in the garden! The Palermo garden bench has showerproof cushions. This is a key feature for outdoor furniture, so you don't have to take the cushions in every time there’s a light shower. It also means that spillages are easy to clean up as they simply wipe off the fabric. 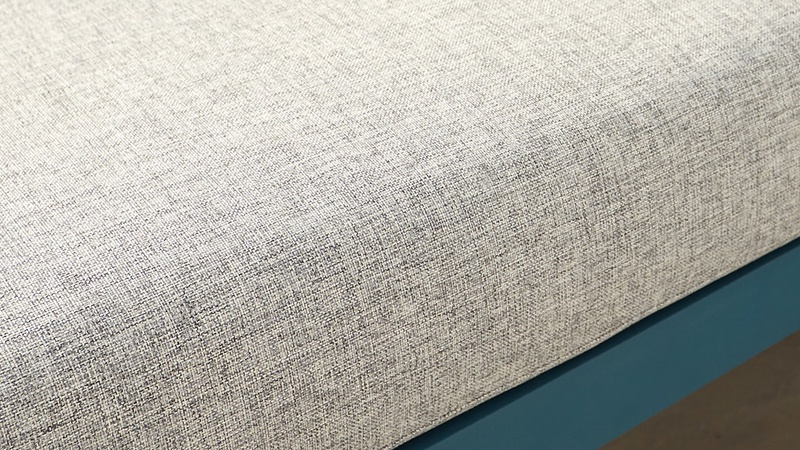 The foam and fibre filling used for the garden bench cushions is the same foam density that we use for our interior seating. 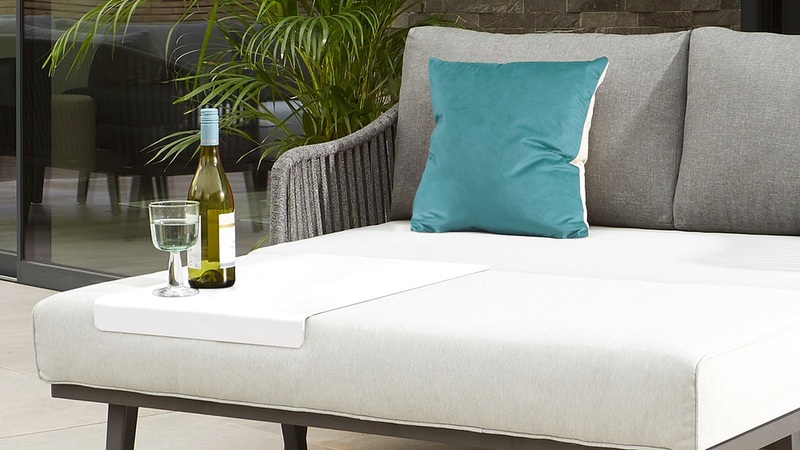 So, whether you’re sitting at the dining table or reading a book in the sun, you’ll be getting the same comfort level we use for our indoor seating range. 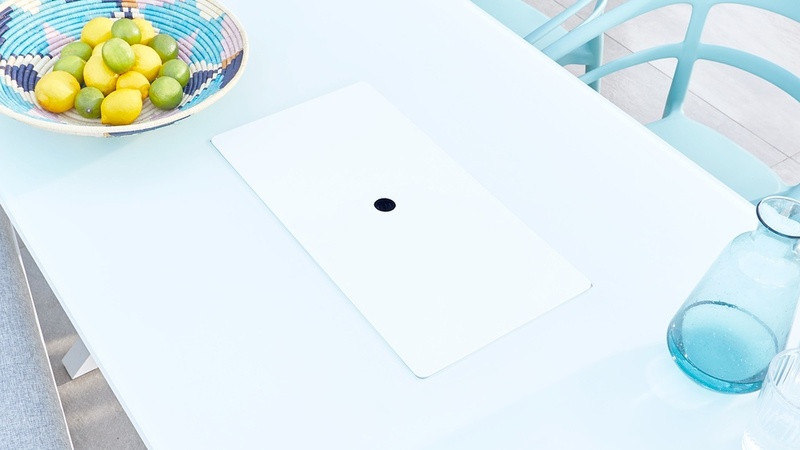 The Rio’s thick grey tempered glass top sits on the frame with anti-slip pads so it doesn’t slip out of place. Frosted glass has a hazy and soft appearance, helping to keep your garden looking crisp, bright and fresh, and is extremely easy to keep clean. A frosted glass surface isn't overly reflective which means you won't get a glaring reflection in the sun. 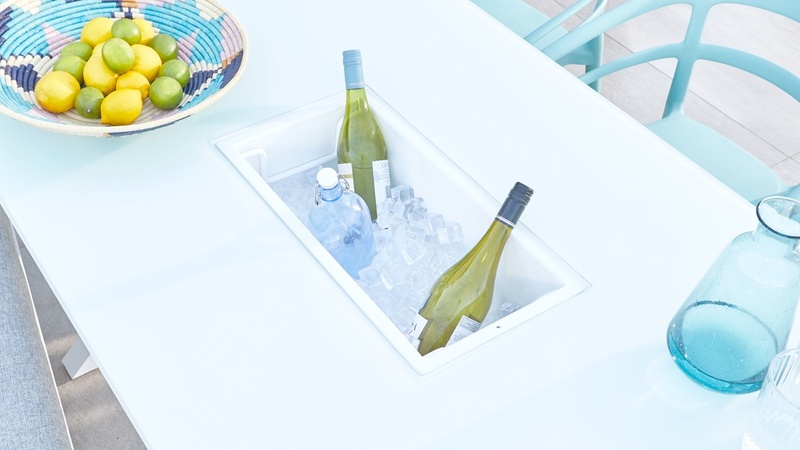 The Vita white garden tray table is an incredibly versatile addition to your garden set. Easily transform an unused space to give a firm, flat table top to keep your drinks and snacks at arm's reach, ideal for those occasions where you rearrange the benches apart from the dining table. 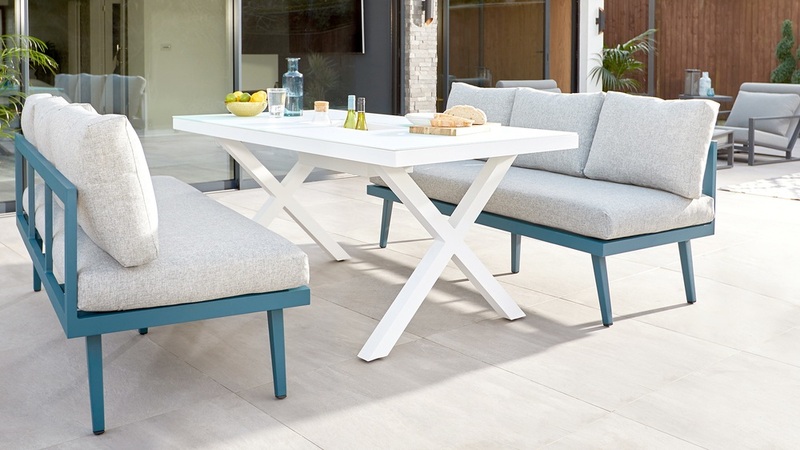 The Palermo bench cushions have been fitted with anti-slip mats that prevent the cushions sliding away from the bench, which means you don’t need to keep readjusting them while you’re enjoying a BBQ. 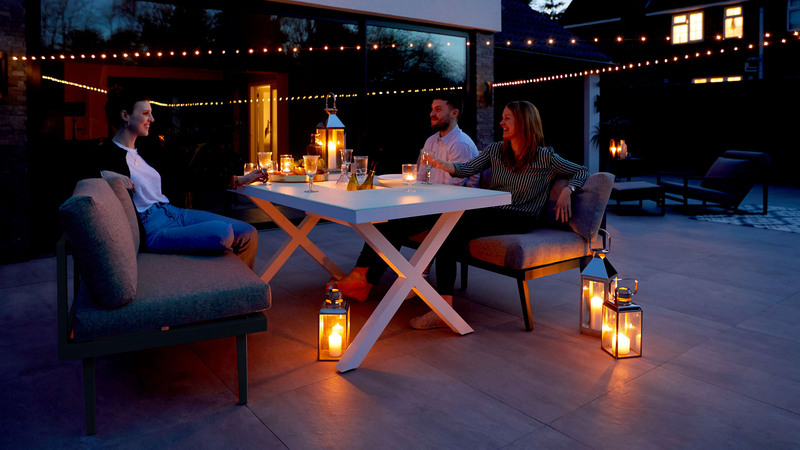 Patios and decking are often not an even surface meaning some garden tables tend to wobble. The Rio Garden Table doesn’t have this problem as we’ve fitted it with adjustable feet. This will not only protect your flooring but makes it easier to keep the table level on uneven floors. 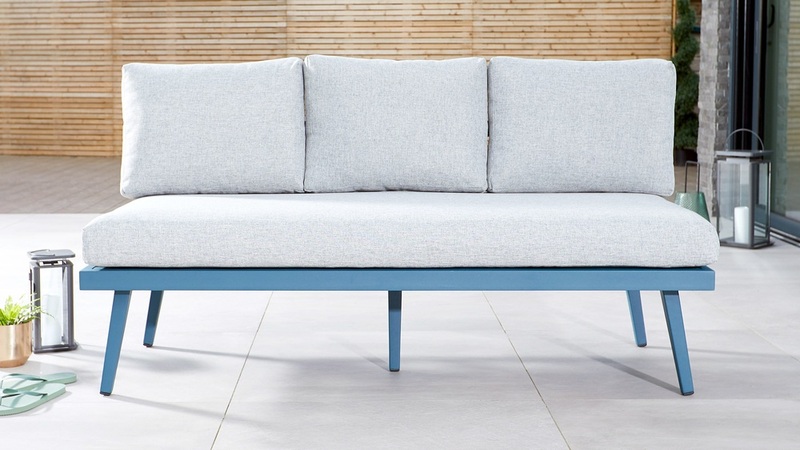 The Palermo Ocean Bench is also available in a left and right hand corner bench if you're after more seating space. Or check out our range of plastic chairs to add a pop of colour.